...quality design components and fabrication. ...complete hydraulic and electrical integration. Advanced Fluid Systems’ custom hydraulic systems are individually designed and manufactured to meet or exceed your application’s needs. Your sales engineer works closely with you from design through installation and we support our systems 24/7. Below are some of our capabilities and advantages that make us your hydraulic system experts. Please contact us for more information or to speak to a sales engineer. 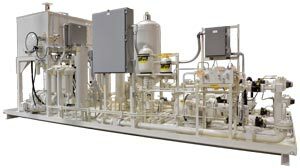 Turn-key hydraulic power units from 1 HP power-packs to 1000 gallon multi-pump systems. PLC control design, closed loop motion profiles and custom software designed and tested in-house. Electric and combustion engine power management and J1939 system integration. LCD touch screen interfaces with real-time system feedback. Radio remote controls that provide precision and accuracy at a safe distance. Visual indicator lights for application sensors and switches. Automatic shutdown and lockout of the hydraulic system and controls. 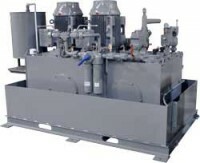 Custom power unit fabrication including stainless steel construction, sound and vibration reduction, and ASME / API enclosures for corrosive and explosion-proof environments. Fewer welds and o-ring flares via the Tube-Mac system reduce leaks while reducing manufacturing times. Filtration monitoring and testing integrated into your PLC and/or control panels. AutoCAD Inventor(3D), a 20 ton overhead crane and 10,000 sq.ft. dedicated to fabrication and testing. Commitment – We take the time to learn your application, how it works and what your needs are before designing a solution. Engineering – Our engineering addresses the hydraulic, electrical and mechanical of your application to design the most efficient and cost effective solutions. Service – Advanced Fluid Systems provides on-site installation and motion controls integration to ensure that your system meets or exceeds your expectations. Communication – Your dedicated sales engineer is your primary contact through concept, design, manufacturing and installation. Flexibility – Installation and system integration are performed on your schedule including evenings, weekends and holidays.